Bass player and composer Massimo Ceccarelli studied at the prestigious Santa Cecilia Conservatory in Rome. As a composer he has won recognition at international competitions such as the Pittaluga of Alessandria, the Lagonegro, and Nurtingen. He composes for both the film industry and the theater. In 1998 he was honored by the Viareggio Competition and in 2005 won the SIAE prize at the Oreste Sindici Competition. Having studied bass with some of the greatest virtuosos of the instrument—L. Buccarella, F. Petracchi, and A. Bocini—he has been principal bass for the Orchestra Regionale di Roma e del Lazio, and holds the same position with other orchestras, often collaborating with Ennio Morricone and other well-known composers. 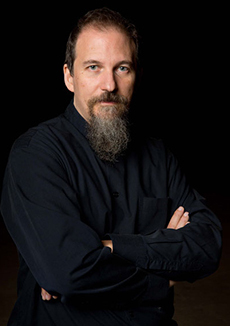 He has played with famous contemporary music ensembles such as the Ensemble Alter Ego, and has worked with such composers as Giya Kancheli, Salvatore Sciarrino, and Steve Reich. He has performed internationally with the Ensemble Algoritmo, with which he recorded works of Ivan Fedele. In 2014 he revised Ennio Morricone’s Studio per Contrabbasso, and gave its world premiere at the Parco della Musica. In 2015 he became principal bass for Rome’s Teatro del’Opera of Roma, where he works with the world’s greatest conductors.